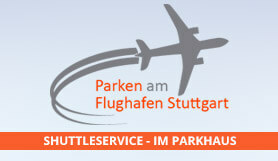 Parking with free shuttle transfer to Stuttgart Airport. This parking is a cheap and very secure option very close to Stuttgart Airport. Your car will be parked in closed, modern underground car park without public visitors. A shuttle driver will bring you to the airport and back for your convenience and at fair prices. The air-conditioned shuttle busses offer a fast and comfortable transfer directly to the airport terminal and upon your return back to the car park. Seats of children are always available in the busses. On demand, your keys can be stored in a safe until you return, for free. All members of staff take good care of your vehicle. During your holiday, they can refuel your car or you can book an additional car care program. Please print your booking confirmation and bring it with you on the day of your arrival. Car cleaning and re-fuel services are available upon request and for an additional fee. On your arrival day, you will be expected at the car park on time. We recommend you to arrive at least 2.5 hours prior to your departure flight to allow a stress-free procedure. Please call them at least 30 minutes before you arrive. Should your flight times change or you will arrive late because of traffic jams, please inform the car park by phone. Your transfer to the airport and back is safe and available to you even if you are late. There is no shuttle bus schedule. You will be driven individually depending on your booked times. Upon your return, please call the car park as soon as you have reclaimed your luggage. A shuttle driver will drive to the airport arrival terminal immediately to meet you there and drive you back to your car at the underground car park. Follow B27 to Hohenheimer Str. in Filderstadt, staying on B27, take exit in the direction of Filderstadt-West/Filderstadt-Plattenhardt. Turn right onto Obere Weinsteige/B27. Take exit in the direction to Filderstadt-West/Filderstadt-Plattenhardt. Follow Hohenheimer Str., drive to Heinrich-Hertz-Straße. Turn right onto Hohenheimer Str. In the roundabout, take the second exit. Your destination is on your right.